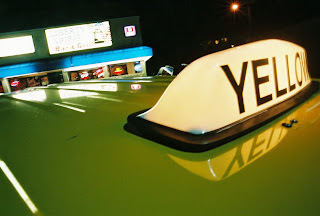 If you ever wondered about the spiritual implications of driving a taxi cab, then this blog is for you. The author is an ordained minister, who drives a taxi and has a somewhat different slant on spirituality and religion after working as an associate editor for the Wittenburg Door, a religious satire magazine, during it final years of publication. He combines taxi cab stories with the transcendent, along with a little science fiction and illustrates it with his award winning photography. Sometimes on a Friday or Saturday night I get a carload of drunk partiers who ask me if I’m the cash cab. At first I would just tell them no, but most of the time they would be persistent and I’d finally humor them with some questions. I would try to make sure that they would get them wrong, but sometimes they would want to choose the category for questions. Even so, I would think up questions that always seemed to stump them, because if they got them right, they might want a free ride. Eventually I came up with a Salem, Oregon version of “Cash Cab,” I called “Double or Nothing Cab”. The way it works is, you get 3 questions. If you get all 3 questions correct, you get a free ride. If you get 2 questions correct, you pay half the meter. If you get 1 question correct you pay the full meter. If you get none right, you pay double the meter. I let them choose the categories. They can change the category on each question, if they want, or they can stay on one subject. If they can’t think of a category, I suggest one. Some typical categories are, politics, religion, music, movies, sports, geography and history, to name some. They can stop the game anytime that they want, and just have a normal taxi ride, because with drunk passengers you don’t want to anger them and create a hostile environment where they will be provoked to attack you or call the office and complain. The first time that I played it was on Halloween in 2008, when I drove a van load of passengers from their house gathering in deep West Salem, to the Liberty Spirit, in South Salem. They were all dressed in costumes, with grease paint and glued on facial hair, so their appearance was comical to me, as we began the trip. “Is this the “Cash Cab”? The guy up front with me asked. “Here in Salem we devised our own version of ‘Cash Cab.’” I told my passenger, and then proceeded to explain how “Double or Nothing Cab” worked. He got excited and when he asked the other passengers if they wanted to play, they all said yes, so I asked them what category they wanted to choose questions from. After they conferred with one another for a minute, they decided on religion, which I thought was an interesting choice, so I proceeded to think up a question about religion. “How many books are in the King James version of the Bible?” I asked. “I’m sorry, there are 66 books in the KJV of the Bible,” I told him. That’s one wrong, so you can’t get a free ride, but you could still just pay half the meter, if you get 2 questions right. They wanted to change the category to sports for the next question, so I decided to use the Olympics. “In what year did the summer Olympics take place in Mexico City?” I asked them. “I’m sorry,” I told her, “but the year was 1968. That’s two wrong, so you’re going to have to at least pay the full fare, do you want to continue, or would you like to stop the game. They wanted to continue, and named politics as the category. “Who did LBJ run against in 1964, when he was elected for the first time after being sworn in because of the Kennedy assassination?” I asked. The back seat was buzzing with people blurting out names like Adlai Stevenson, Henry Cabot Lodge and finally Barry Goldwater. “Barry Goldwater,” the guy up front told me. “Correct,” I told him, as we pulled into the Liberty Spirit parking lot. “Thanks,” I told him. “If you want to play again, just ask for #25, at Yellow Cab. Very fabulous blog, while reading it enjoyed. If you want to visit any place in india book Taxi service or cab service at your doorstep at very economical rates. We offer special offers on every booking. Hurry up! Book taxi taxi service to avail the services. Great Article! Keep posting this kind of useful articles. To visit more beautiful destinations in India Book taxi service or cab service now at ganraj Travels at very lowest cost with top class quality. Ganraj travels is the most trusted and affordable cab service in india.